Surprising but true: the major cause of tooth loss in adults is not decay, but periodontal disease. More than half of all people over age 18 have at least the early stage of periodontal disease. After age 35, about three out of four adults are affected. Some people seem to be more susceptible to gum disease than others. Anything from pregnancy, systemic disease (like diabetes), and certain medications can contribute to its development. Smoking increases the likelihood dramatically (and renders treatment less effective). Some unlucky folks are inherently more susceptible because of unique bacterial/chemical mixes in the mouth that encourage plaque. The results of gum disease aren’t pretty. Early stages of disease show up as persistent bad breath and red, swollen gums. 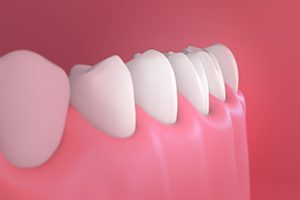 Eventually, if the disease progresses without treatment, tooth loss is inevitable. If you are diagnosed with periodontal disease, we’ll start you on an appropriate treatment program, but we’ll depend on you to continue the work at home. It’s critical to the success of your treatment! come in regularly—we’ll want to see you every three months to monitor your progress and keep your motivation strong. The good news is we can treat the disease at every stage. If you notice any signs of gum problems, call us for a periodontal exam.